With Syndeia 3.2, Intercax offers a new capability for user-defined mappings in model transformations. Syndeia, the MBE (Model-Based Engineering) platform from Intercax, enables the creation of a single digital model distributed over multiple engineering software tools. Part of building that total system model may require transforming part of a model in one tool into an equivalent model in a different tool. The two models remain connected so that common information can be shared, compared and harmonized as the model evolves. 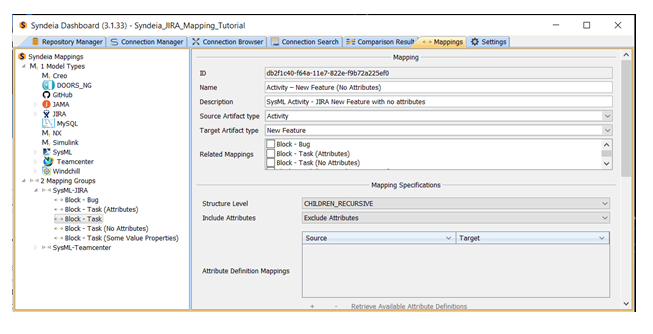 A significant conceptual challenge is deciding how to map element types, attributes and relationships across the tool boundary, as indicated in Figure 1. Up to now, Syndeia had hard-coded most of those choices, with only a few user-selectable options. Customers requested more flexibility to control what information is shared and what element types are accommodated. 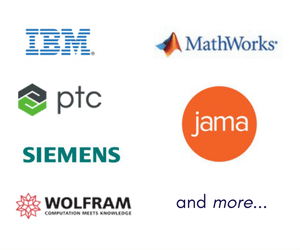 In Syndeia 3.2, users can define and use their own custom mappings between SysML (Rhapsody or MagicDraw) and Atlassian JIRA, Siemens Teamcenter, IBM DOORS NG, and Jama. Creating, editing and deleting custom mappings use a new tab on the Syndeia dashboard (Figure 2). Accessing this tab requires a special software license in addition to the regular user license. This mapping license will be provided at no cost to all new and upgraded Syndeia 3.2 customers, but we recommend that it be restricted to only a few advanced users or system administrators. They can create and edit custom mappings that can be distributed and used by any Syndeia user within the organization. Syndeia 3.2 comes with extensive documentation and hands-on tutorials to get new users started. In Part 2 of this blog series on new features in Syndeia 3.2, we showed how reference connections can now be made between non-SysML model elements, e.g. a Teamcenter item to a Jama requirement or a JIRA issue. Syndeia does not yet support the same facility for model transform connections, but it will in future releases and this will cause the number of possible mappings to increase geometrically. The user-defined mappings described here creates the framework for this next step, as well as the addition of new tool interfaces.